The below comments (in Black) were originally tweeted in Real-time from the back row of a movie theater and appear @BackRoweReviews. Though efforts were made to tease rather than ruin this movie’s memorable lines and moments, some spoilers may exist in the following evaluation (in Red). For concerns over objectionable content, please first refer to one of the many parental movie guide websites. All ratings are based on a four star system. Happy reading! “You don’t have a clue where your money is.” Scary reality. “Glitch.” Is it possible this movie is unintentionally timely, i.e. the edited #Iran video? “We don’t do journalism period.” Does anyone anymore? #LeeGates has some decent dance moves. “It’s all rigged.” Not exactly a news flash. “Start hosting.” Way to turn the tables. Shoot the star of a news show live on TV? Shades of #Network. Who needs enemies with a girlfriend like that? “It’s not the computer’s fault.” Sure, buddy. “We have an 80% chance of an 80% chance.” Hilarious! Talk with the weapons up. Negotiation at gunpoint. “What’s wrong with making a profit?” Plenty if people are made to suffer for it. Final analysis: a message film wrapped in a thriller built on a farce. Entertaining but not earth-shattering. Rating: 2 1/2 out 4. 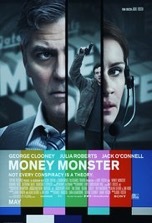 Nice to see Clooney and Roberts together again even though they only share one scene. If money is the root of all evil, Lee Gates (George Clooney), a Jim Cramer style stock tip show host, is desperately wicked. As the movie opens, Gates and his producer, Patty Fenn (Julia Roberts), are engaging in some good-natured banter as they prep for another episode. But as filming commences, an unexpected visitor drifts onto the set and sends the plot veering in a different, unexpected, and ultimately, less interesting direction. It’s rare that such scintillating stars (Clooney and Roberts in front of the camera and Jodie Foster behind it) should be attached to such a banal, lackluster film. What starts off as a compelling The Newsroom style TV studio drama rapidly morphs into a high stakes thriller with Gates doing his finest fast-talking to avoid being blown to bits by a suicide vest on national television (a knowing riff on Sidney Lumet’s prescient 1976 film, Network). The movie’s tonal shift is jarring and really detracts from what sets up as a dramatic edutainment centered on the turbulent world of finance. This bait-and-switch narrative choice may annoy or confuse some audience members since the genre at the beginning of the film isn’t the same as when it ends. Sadly, the more the thriller storyline progresses, the daffier the movie becomes and the more we don’t care who comes out alive…or who doesn’t. It’s a shame that such tremendous talent was squandered on such mediocre material and that the movie’s intriguing premise, which contains a salient message about the current state of our economy and its effect on the scores of struggling citizens in our society, is thrown away in favor of the kind of remedial fare you can find on any run-of-the-mill TV procedural. So what did the actors see in this script that made them want to sign up? Maybe it had nothing to do with the script and everything to do with Clooney and Roberts jumping at another chance to perform together (this is their fourth big screen collaboration). Or maybe their decision was simply based on a desire to work with Foster. Perhaps I’ve got it all wrong and their true motivation for making this movie wasn’t camaraderie or artistic integrity…just the money.